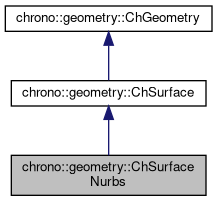 Geometric object representing a NURBS surface. Get the order in u direction. Get the order in v direction. Method to allow de-serialization of transient data from archives. Tell if the surface is closed (periodic) on U. Tell if the surface is closed (periodic) on V.
This is a surface, so manifold dimension=2. Tell if the visualization is done only as UV isolines. Set if the visualization is done only as UV isolines. Returns the radius of the sphere which can enclose the geometry. Compute center of mass It should be overridden by inherited classes. Compute the 3x3 covariance matrix (only the diagonal and upper part) It should be overridden by inherited classes. Constructor from a given array of control points. Input data is copied. If the knots are not provided, a uniformly spaced knot vector is made. If the weights are not provided, a constant weight vector is made. morder_u order pu: 1= linear, 2=quadratic, etc. morder_v order pv: 1= linear, 2=quadratic, etc. mknots_u knots, size ku. Required ku=nu+pu+1. If not provided, initialized to uniform. mknots_v knots, size kv. Required ku=nu+pu+1. If not provided, initialized to uniform. weights weights, size nuxnv. If not provided, all weights as 1. Evaluates a point on the line, given parametric coordinate U.
Parameter U always work in 0..1 range, even if knots are not in 0..1 range. So if you want to use u' in knot range, use ComputeUfromKnotU(). Computed value goes into the 'pos' reference. It must be implemented by inherited classes. Initial easy setup from a given array of control points. mknots_u knots u, size ku. Required ku=nu+pu+1. If not provided, initialized to uniform. mknots_v knots v, size kv. Required ku=nu+pu+1. If not provided, initialized to uniform. Generated on Wed Apr 17 2019 09:51:48 for Project Chrono by 1.8.9 .